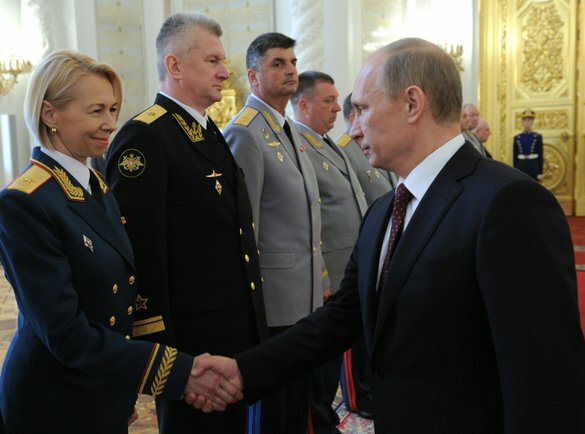 No, not newly-minted General-Major Yelena Knyazeva and President Putin. The couple is Knyazeva and her husband, Deputy Chairman of the Moscow City Duma, Andrey Metelskiy. It’s not surprising Kremlin.ru published this picture of the Supreme Glavk shaking Knyazeva’s hand instead of some run-of-the-mill male general’s. When Putin elevated the fiftyish Knyazeva to one-star rank last month, the Russian press noted his decree gave the Armed Forces a female general for the first time in a number of years. The last one was the world’s first woman in space, Valentina Tereshkova, who reached general-major in the 1990s. Media reports added that several women currently hold general officer ranks in the MVD and other uniformed federal services. This year the Russian Armed Forces indicated having 3,000 female officers in the ranks, a 50 percent increase over 2011. There were 28 (now 27, of course) women colonels. There were only 12 female O-6s in 2011, according to RIA Novosti. Yelena Georgiyevna is Deputy Chief of the Defense Ministry’s Main Directorate for International Military Cooperation. Before that, she headed the English Department at Moscow’s Military University. That university now encompasses the Military Institute of Foreign Languages (VIIYa) where she graduated and taught for many years. She became chief of VIIYa’s English faculty in 1995. Her participation in international projects during the heyday of Russia-NATO cooperation provided a logical segue to her current duties. But her timing was fortuitous too. Under Serdyukov, women emerged in various top Defense Ministry posts, although Knyazeva’s case was somewhat different because she rose inside the military department. At VIIYa, Knyazeva met her future husband, Andrey Metelskiy, according to Krasnaya zvezda. Some eight or nine years her junior, Metelskiy studied Farsi and French at the military institute. Metelskiy’s an interesting figure. In a Bratishka.ru interview, he indicates he was an 18-year-old lieutenant (!?) serving in Afghanistan when he was wounded in 1986. After finishing VIIYa and leaving the army, Metelskiy was a businessman with a somewhat confusing political biography. One observer claims he was a Derzhava supporter who only emerged in the youth section of Unity in early 2000. But Metelskiy’s mainline biography says he was a deputy chairman of the Moscow city branch of Unity before the December 1999 State Duma elections. He went on to be first deputy of the Moscow regional branch of Unity’s successor, United Russia. 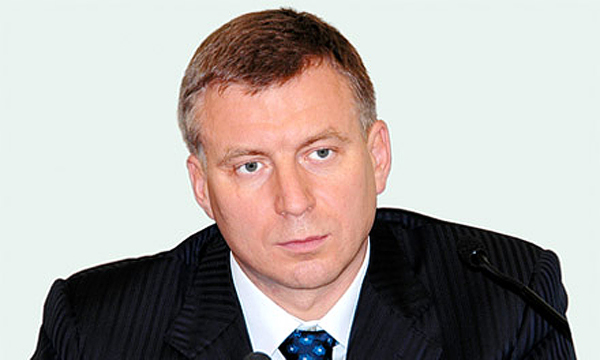 Metelskiy was elected to the Moscow City Duma in 2001, and is currently in his third term. He has been a Duma Deputy Chairman since 2004, and heads the United Russia faction which holds an overwhelming 32 of 35 seats in the municipal legislature. Metelskiy represents the Izmaylovo area in northeastern Moscow. The observer above recounts a legal dustup in late 2005 between Metelskiy and Rodina’s Dmitriy Rogozin who accused him of sporting military awards he didn’t earn. But Metelskiy won a defamation case against today’s deputy prime minister for the OPK. On Medvedevu.ru, a man tells his version of a 2009 car accident with Knyazeva, Metelskiy, and their Lexus. According to him, Metelskiy denied causing the crash, threatened him, and advised him to forget the whole incident. Nor did the victim get satisfaction after wending his way through the court system for a couple years. Knyazeva and Metelskiy are an interesting and well-connected Moscow power couple. Putin was probably just renewing his acquaintance with Knyazeva since it’s more than likely they’d already met given her husband’s position.